Founded as one of London's inns of court late in the fourteenth century, Furnival's, an extension of Lincoln's Inn, survived the Great Fire of 1666, and was one of the nine Inns of Chancery from 1383 to 1817. 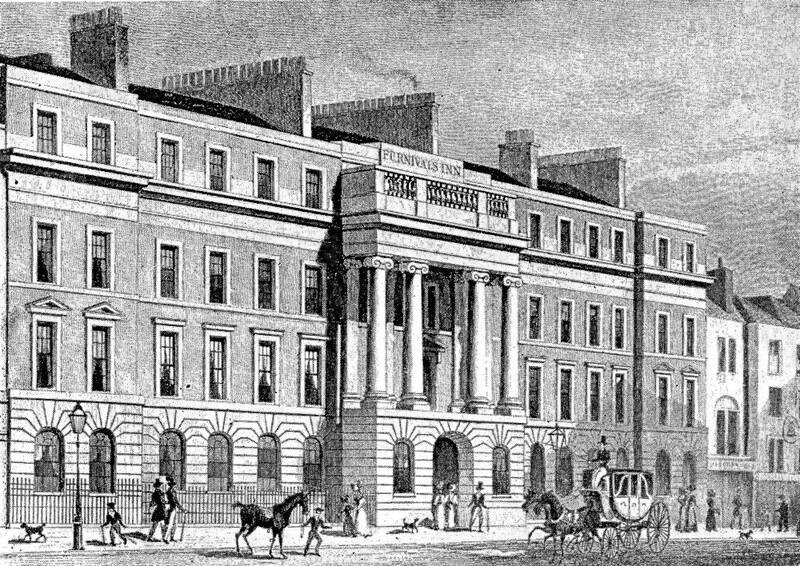 Dissociated from the legal system in the early nineteenth century, the medieval building was demolished in 1818; then a decade later a block of apartments opened on the site with an impressive neoclassical facade designed by the architect Thomas Hosmer Shepherd in 1828. Located centrally, in Holborn, it was ideally situated for up-and-coming writer Charles Dickens between 1834 and 1837, but proved unsuitable after his marriage. In Dickens's original bachelor apartments at no. 13, which he shared with a younger brother, Frederick, a fateful conversation occurred on the morning of 10 February 1836, between the junior partner of publishers Chapman and Hall and the young author of Sketches by Boz (issued in volume form just three days earlier, on Charles Dickens's twenty-fourth birthday). William Hall then proposed that Dickens supply the humorous texts for a series of Cockney sporting illustrations by popular artist Robert Seymour. For his involvement in this "Nimrod Club" project, to be published in twenty monthly numbers, each 12,000 words in length, young Dickens would receive fourteen guineas per issue. Under Dickens's genial satire the episodic story of the sporting Londoners quickly morphed into the picaresque novel The Pickwick Papers. After his marriage to Catherine Hogarth on 2 April 1836, Dickens had a brief honeymoon in Chalk, and then returned with his bride to the larger chambers of no. 15, necessary to accommodate the couple, Fred, and Catherine's younger sister, the sixteen-year-old Mary. 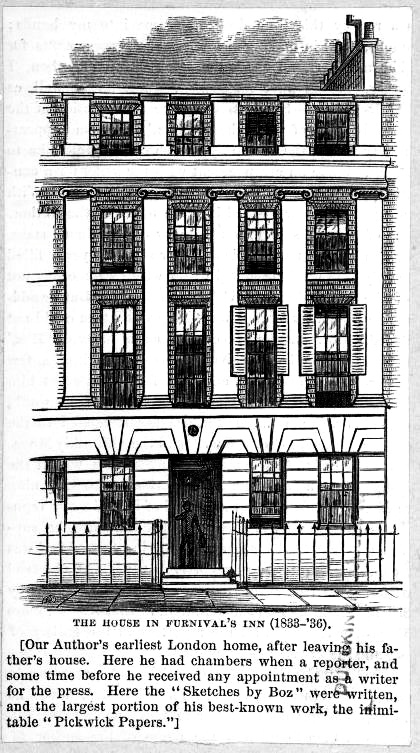 Charles Dickens, Junior ("Charley"), was born here on 6 January 1837, compelling the Dickens ménage to move to more commodious quarters at Doughty Street. From 1888 to 1889 dramatist James M. Barrie lived in chambers at no. 7. 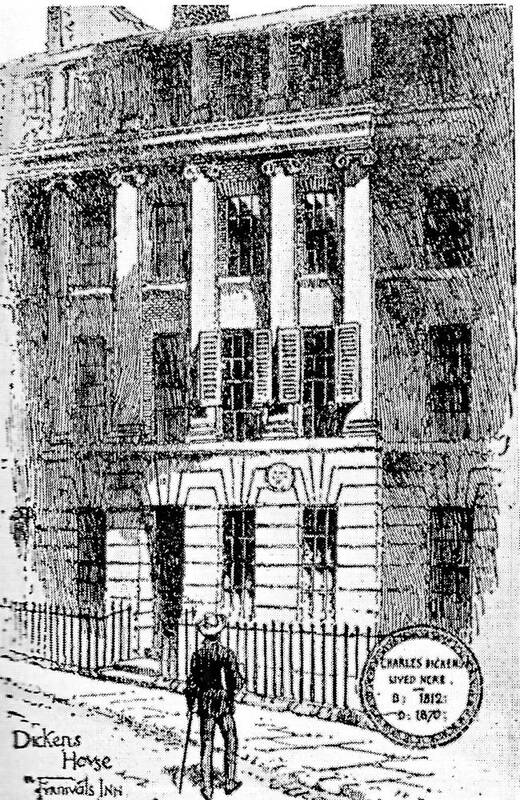 Furnival's was demolished in 1889; the present building on the site, Holborn Bars, features a bust of Dickens and a plaque set beneath its portico. Furnival's Inn drawn by F. G. Kitton. Source of images — top left: New York Public Library: Print Collection, Miriam and Ira D. Wallach Division of Art, Prints and Photographs Digital ID: 1240930. Record ID: 593345. Digital Item Published: 12-8-2004; updated 7-11-2008. The other two images come from page 82 of the 1872 Lippincott printing of Forster's Life. Forster, John. The Life of Charles Dickens. 2 vols. The Memorial Edition. Philadelphia: Lippincott, 1872. Lynch, Tony. "Furnival's Inn, London." Dickens's England: An A-Z Tour of the Real and Imagined Locations. London: Batsford, 2012. Pp. 90-93.